Water forms many different habitats. There are fresh water habitats in rivers and lakes and salty water habitats in the sea. Many animals including fish and birds live in the water. Water in lakes and rivers is fresh, not salty like sea water. The banks, the water, and the muddy beds of rivers and lakes make different habitats for all kinds of animals and plants. The water is full of animals and plants that can only be seen through a microscope. 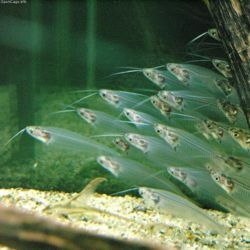 Fish swim among the underwater plants, feeding on the plants and other water creatures. Fish don't have feet because they don't walk. They live in a water habitat and hence they swim. Fish can breathe under water because they have gills. A fish cannot survive outside its water habitat. Many other animals do best in a water habitat. Some live all their lives underwater, like oysters and starfish. Some live part of their lives under water and part on the land, like frogs and salamanders. Some live on land near the water, like herons and crabs. All of these animals depend upon the water, the plants, and other animals nearby. The sea is the biggest habitat of all. 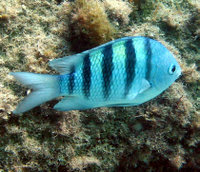 The fish and sea creatures that live in sunny shallow water are different from those that live in the cold and dark areas at the bottom of the sea. The coral reef in sunny, shallow water is always busy. Corals look like plants but they are really the skeletons of millions of tiny sea creatures. Colorful fish dart around, finding plenty to eat. Some plants and animals depend upon the salty water to live. Clams, oysters, and jelly fish live in the salty ocean, along with plants such as seaweed. Whales, dolphins, sharks, and other animals that live in an ocean habitat need salt water. If you put them into water without salt they wont survive. And if you put a freshwater fish into salt water it wont survive either. Each water animal and plant needs to be in the kind of water habitat to which it is suited. Directions: Answer the following questions. Write about water habitats in your own words. Q 1: ___________ live all their life under water. Q 2: A fish can survive outside its water habitat. True or false? Q 3: ______________ living in an ocean habitat, need salt water. Q 4: Fish can breathe underwater because they have __________. Q 5: __________ live part of their lives under water and part on the land. Q 6: ___________ lives on land near water. Q 7: If you put a freshwater fish into salt water it wont survive. Q 8: Water in the sea is _________.